Today’s 5G corridor funding announcement is more than just a typical industry announcement — it’s a sign that Canada is gearing up for a 5G revolution. Funding for the initiative will be collected through a joint partnership between Innovation, Science and Economic Development Canada (ISED), the Ontario and Quebec governments, as well as Thales, Ciena, IBM, Ericsson and CGI under the name Evolution of Networked Services through a Corridor in Quebec and Ontario for Research and Innovation (ENCQOR). The Canadian governmental partners will contribute approximately $200 million CAD, while industry partners will fund the remaining $200 million. The ultimate question, however, is how precisely will today’s $400 million CAD announcement affect Canadians? To begin with, it’s important to note that the 5G corridor will not be a single, contiguous space of innovation. Henderson said that there will be five innovation hubs at first. The names and exact locations of those hubs have yet to be announced. Henderson notes that “virtually anyone” will be able to connect to the open networks, but was unable to confirm whether the innovation hubs will be fully open to the public. The hubs will be filled with small and medium enterprises (SME) looking to develop and investigate 5G applications. “This testbed is designed specifically around enabling 5G tests, deployment [and], to a certain degree, research,” said Rodney Wilson, Ciena’s chief technologist of research networks, in a phone interview with MobileSyrup. Of course, it’s important to recognize that, as of right now, we don’t really know exactly how 5G technology will be used by both the general public and industry. We know that 5G will be able to send and receive more information faster, with lower latency, but how precisely those features will be implemented is yet to be seen. As of right now, 5G is primarily being promoted as a way to improve Internet of Things (IoT) support and machine-to-machine communications. “The market is coming, 5G is coming and for Canada to be a part of that, to be a part of the IoT ecosystem, to prepare these companies is the goal,” said Henderson. However, the fact that the ENCQOR coalition is comprised of five global tech companies means that the companies that will soon populate the corridor will have access to leader global sources of mentorship — mentors well-suited to answering the 5G implementation question. “If an entrepreneur develops an application… [and wants] to partner with Ericsson, let’s say, it’s a great opportunity for them to do so,” said Corr. Of course, industry involvement isn’t purely altruistic. After all, these companies will be gaining terabytes of test and research data, to say nothing of the fact that they’ll position themselves as 5G leaders once the technology formally rolls out. While the corridor is great news for businesses, it’s also important to remember that 14 post-secondary institutions — including Carleton University, Algonquin College, the University of Toronto, Queen’s University and Ryerson University — have also expressed support for the ENCQOR initiative. “The idea is the universities can engage in the corridor itself, can connect to the corridor,” said Henderson. 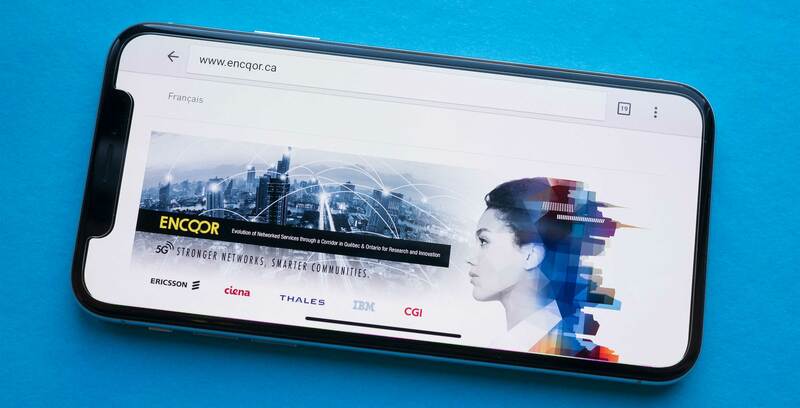 As for Canada’s wireless carriers, Henderson and Corr both said that they’ve been involved in ENCQOR discussions. Granted, it’s still necessary to acknowledge that there’s still quite a bit of work that needs to take place before any country formally deploys commercial, public-facing 5G. Still, there’s no denying that today’s funding announcement is a substantial step forward in guaranteeing that Canada remains competitive in the global race to 5G. “Canada has an opportunity to either be a follower and watch the innovation and exciting things and invention and IP development in other countries, or we have an opportunity to lead,” said Wilson.